You never know what's around the corner and when you might need to stop quickly and safely. For this reason, it's essential to make sure that your car’s brakes are working as well as possible at all times. If you are unsure about the condition of your brakes, our friendly, expert technicians will check your braking system to identify any issues and help you stay safe on the road as well as giving you impartial advice about any work that may need to be carried out. All brake components fitted by our experts come with a 12 month or 12,000 miles (whichever comes first) guarantee. At ATS Euromaster we offer a choice of brake inspections to fit your needs with flexible booking times to suit your needs. We offer two kinds of brake inspections: a free primary front brake visual inspection (which takes around 30 minutes to complete) and a Full Brake Inspection that takes approximately one hour. Our visual brake inspections examine core brake components for damage and rust spots which could affect vehicle performance. Our full inspections look at the condition and wear on brake discs, pads and shoes, the condition of calipers/wheel cylinders, brake pipes (checks for leaks or corrosion), brake lights, handbrake cable and linkages, brake drums and fluids giving you a clear overview of your car’s braking capabilities. Brake pads are made to last thousands of miles, but eventually, they will start to wear and need replacing. They absorb some of the biggest forces in day to day driving ensuring your safety so it’s very important that if you think they need looking at, you get them checked as soon as you can. Brakes discs are a vital part of a disc braking system, they help slow down your car quickly and safely. When braking, if your car shudders this is often a sign you need to get your brake discs replaced. 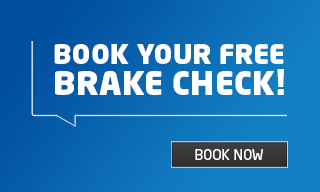 To be sure you can book in for a free brake check at one of our centres. Brake calipers are very sturdy and often outlast the car. However should damage or wear and tear occur they are a vital piece of the braking system that will need to be replaced. If you hear any sounds or vibrations when braking this could be a sign your brake calipers need replacing.